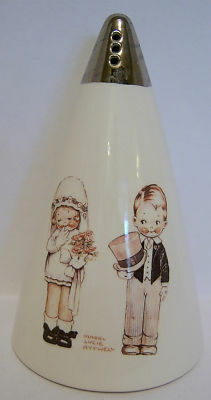 This is a really delightful Sugar Sifter/Shaker from Carlton Ware. Set on a white ground is one of the usual cute pictures from Mabel Lucy Attwell of a little bridal pair, complete with their blushing rosy red cheeks. The conical end is a vibrant silver colour. These images form part of the Carlton Ware releases of a variety of Mabel Lucy Attwell products, although this one is only a Studio Trial and is not in production . It measures 6 inches (15 cms) in height with a bottom diameter of 3.5 inches (9 cms) and is in perfect condition. It is complete with stopper. It is appropriately backstamped showing 'Studio Trial'.